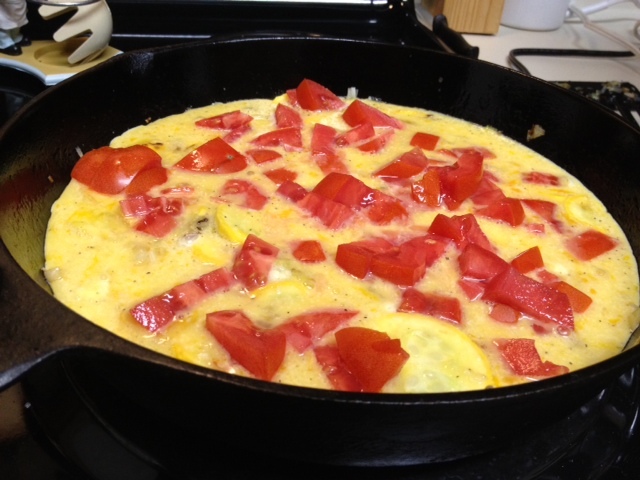 I’ve always kind of had an irrational fear of making frittatas (or frittate as the Italians would say). 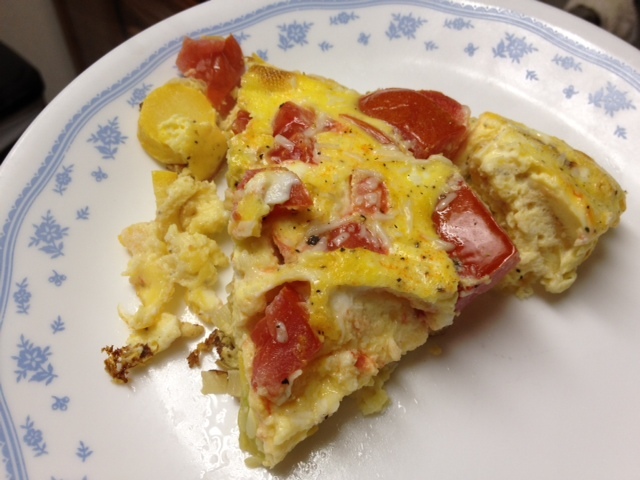 I think it probably stems from the time I made a quiche for my breakfast day at work, and realized once I got ready to serve it that the egg was still runny. So, panicked, I ran to the kitchen and threw the entire quiches (yes, there were two) in the microwave and started re-cooking them. Suffice to say, it was a bit stressful and I was terrified I’d make all my co-workers sick with partially-cooked egg. But I’m realizing how silly it is to be scared of frittatas, because they’re about the best, easiest, most versatile food you can make. 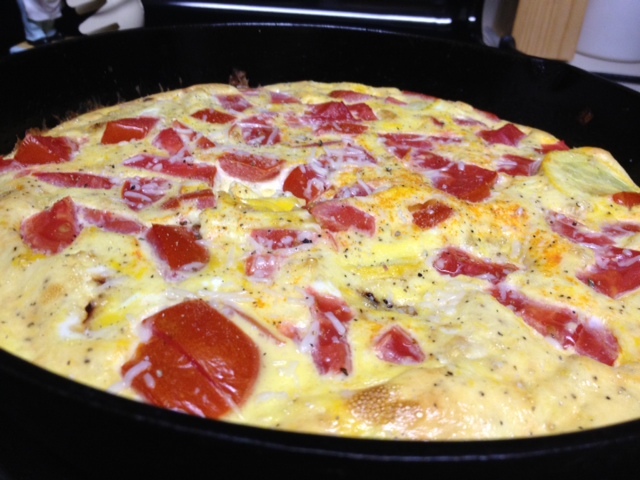 It’s basically an open-face omelette—in fact, “frittata” comes from the Italian word for “to fry”. 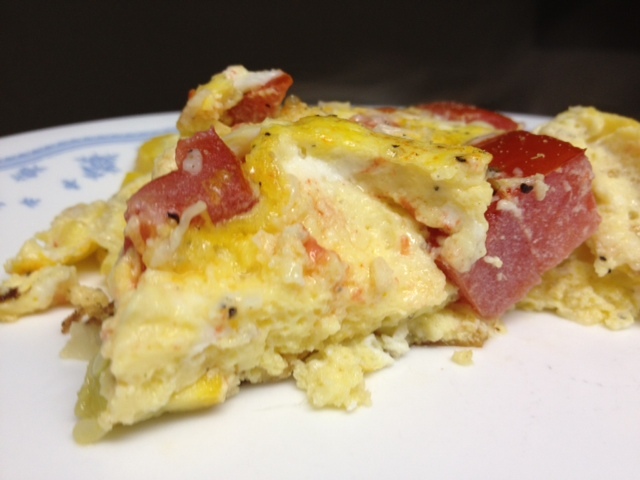 What’s truly excellent about it is that it’s what I call a “kitchen sink” food—meaning you have a basic base (in this case eggs, a little milk, seasoning, & cheese) and then you can add whatever you happen to have on hand to finish it off. In this case I am still trying to use up the gobs of summer squash and scallions that came in my CSA box a week and a half ago, and I had some lovely tomatoes sitting around as well. But you could put whatever you want in here…zucchini, peppers, any other veggie, different types of cheese, fresh herbs (yes please!). 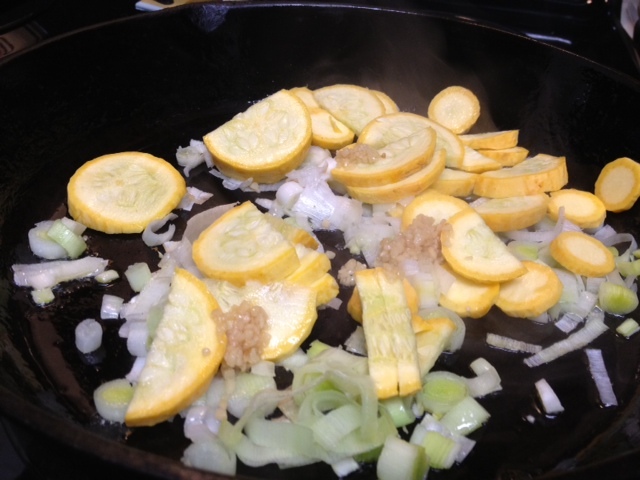 The biggest thing is determining which things need sauteed first. Good rule of thumb: if it won’t be cooked to the right consistency with about 10 minutes in an egg mixture in the oven (tomato, for instance), you should cook it up first. You can saute it, or roast the veggies to add some lovely flavor, or if you have leftover cooked veggies you can throw them in too. I kind of made up the recipe by perusing a few online and then choosing the elements and proportions I liked from each. I went with about six eggs (which was a perfect amount). Preheat the oven to 400. I would use a cast iron pan for this if you have it, you definitely need a stove-to-oven pan. Start with some olive oil in the pan on the stove (medium to medium-high), but I wiped some on the sides too so the frittata didn’t stick. 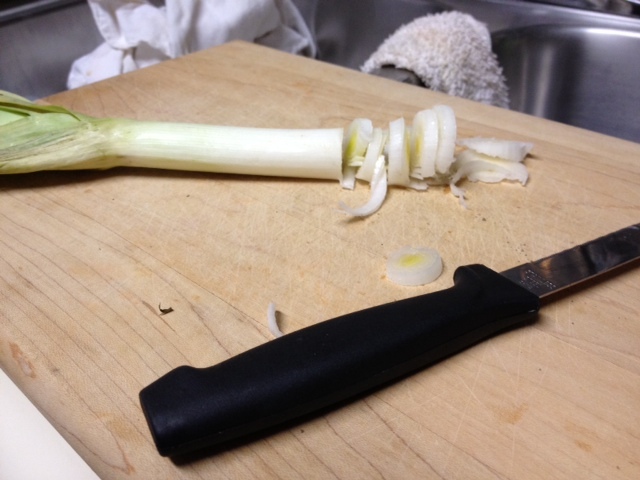 Start by chopping up the scallions (also called green onions or spring onions). You could also use onions, leeks, shallots, whatever. The scallions, all fried up and soft, made a lovely kind of crust on the final product. They add almost a sweetness to it, definitely a richness. 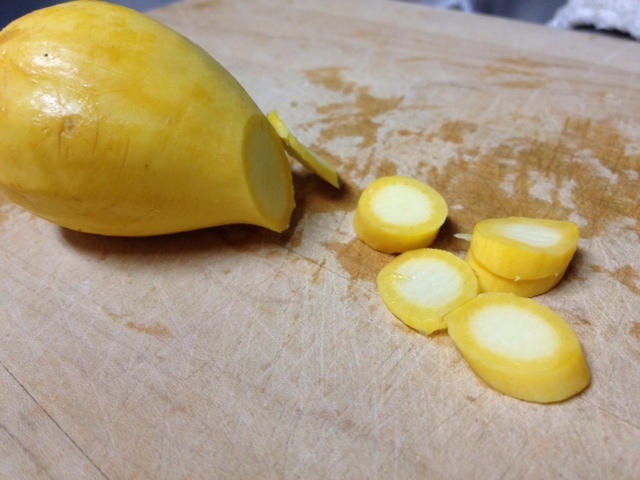 Slice up the squash or other veggies into nice bite-size pieces. You want them to be fairly uniform and not too big so they’ll soften up. Toss the scallions and some garlic in a cast iron pan with some olive oil. Saute this for a few minutes, then add the squash or any other veggies and saute for maybe five minutes or so. 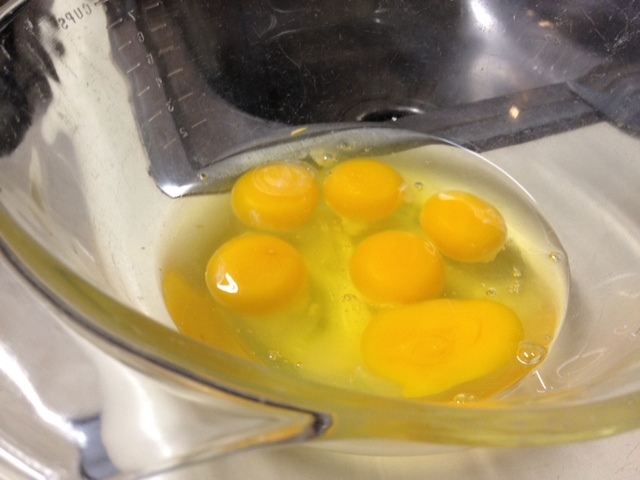 In a bowl you’ll put together the egg mixture. I did six eggs. Added about a quarter cup of skim milk, and shook in some parmesan-asiago blend cheese, as well as some salt and pepper. If you had fresh herbs, they’d go in here to get well-mixed. In hindsight I would definitely add some cheddar or other cheeses too (feta, goat cheese, etc. )—would make the end product a little cheesier. 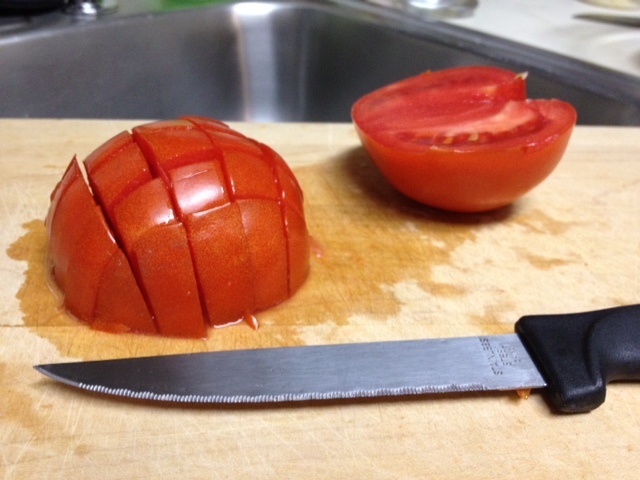 For soft things like tomato, chop them up but don’t saute them ahead of time. 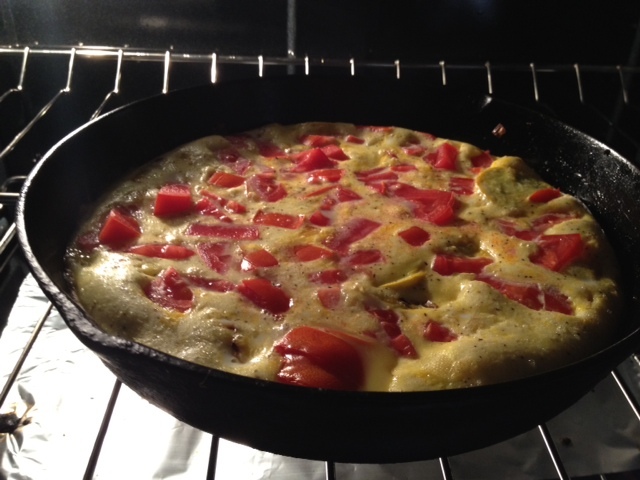 Pour the egg mixture into the pan on the stove, and sprinkle the tomato on top, as well as any extra cheese. You could also add some already-cooked meat (cooked bacon, sausage, leftover chicken, etc.) if you wanted. Cook on the stove for a couple minutes, until the sides start to set a little. Once the sides start setting, transfer the pan to the oven. You’ll want to cook for 15-20 minutes, until the egg is all set. I put it on broil for the last minute or two in order to get a nice little browning and crust on the top. Finished! Whole thing took like 25-30 minutes from start to finish. Super easy breakfast, lunch, or dinner. And I think I actually like the leftovers even better than the freshly-baked frittata. Since I’m only one person, I put half of the pan in a couple of tupperware containers for breakfast during the coming week (don’t judge, I ate half of the frittata myself for breakfast—I’d just run a few miles in 100-degree heat!). Saute garlic, any onion-like veggie, and then other veggies in olive oil in a cast iron pan on medium to medium-high for 5-7 minutes. 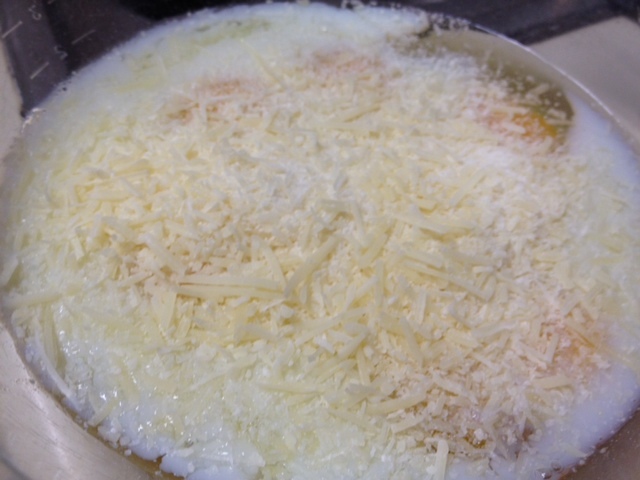 In a separate bowl combine eggs, milk, cheese, salt, and pepper. 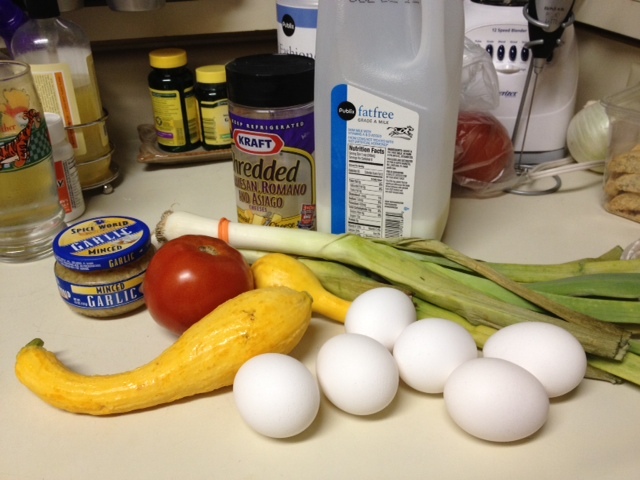 Once veggies are cooked, pour in the egg mixture and top with any other soft veggies or cheese desired. Cook on the stove for a couple minutes, until sides begin setting. Transfer to oven and bake for 15-25 minutes, until egg is set. Can broil last minute or so to get a nice brown crust on top. Serve hot or as cold leftovers.